California water officials have approved more than $2.5 billion for eight water projects across the state, marking one of the largest investments in water storage in decades. The proposed projects, including two in the Bay Area, will now begin seeking permits and looking for the remaining funding they need. Half of the eight projects approved on Tuesday by the California Water Commission are more traditional reservoirs and dams, while the other half focus on groundwater storage and recycled water. California voters approved the funding in 2014 as part of Proposition 1, a major water bond that passed during the height of the drought. The funding can only go toward the “public benefits” of the projects, which include ecological restoration, recreation, flood control and emergency water supplies. Five of the projects are eligible for their full funding request, while three projects received partial funding because they scored lower in their overall benefits. Still, checks won’t be heading out the door immediately. The projects must show they’ve gotten commitments for at least 75 percent of their non-Prop 1 funding. If that doesn’t happen by January 2022, the water commission can’t award the funding. 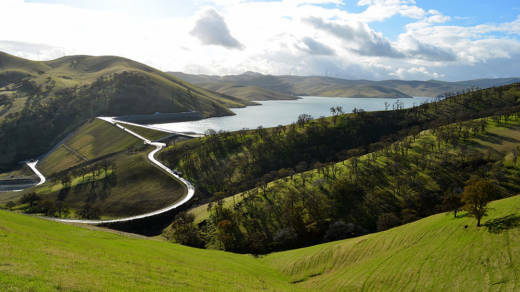 In the East Bay, Contra Costa Water District plans to expand Los Vaqueros Reservoir. It’s considered an “off-stream” reservoir because it isn’t located in the middle of a river, which is generally considered less environmentally destructive than a traditional dam. Today, the reservoir supplies about half a million residents in the East Bay. The water district would raise the dam by 50 feet, costing $980 Million, almost doubling the capacity of the reservoir. “It’s really represents a positive step forward for greater water reliability for the entire Bay Area region,” says Oliver Symonds, a spokesperson for Contra Costa Water District. The extra storage space would be used by as many as 14 water districts in the Bay Area and Central Valley, who would use it for water from the Sacramento-San Joaquin Delta. The water could also go to wildlife refuges in the Central Valley. The California Water Commission awarded $459 million for the project. The balance would be paid for by the water districts who would use the storage space. Contra Costa Water District would then recoup some of what it paid to build and expand the reservoir in 2012. In the South Bay, Santa Clara Valley Water District is seeking to expand Pacheco Reservoir, outside of Gilroy. Today, it’s a small reservoir on Pacheco Creek. A new 319-foot dam would expand the reservoir’s capacity by 25 times. A connection would be built to San Luis Reservoir, which holds water from the Sacramento-San Joaquin Delta. The water commission awarded the project $484 million. To reach the overall cost of $969 million, the district will be looking for federal funding and will add to local water rates for its 1.9 million South Bay customers. The project still has several hurdles, including doing a full environmental analysis.